Alain Juppe, the closest confidant of Jacques Chirac, has long been regarded as a potential successor to the French president. Despite a inauspicious stint as Prime Minister in the mid-1990s - when an attempt at welfare reform led to crippling strikes and a stunning defeat at the polls - Mr Juppe remained a leading figure of the French right. However his conviction for presiding over illegal party funding in the 1980s and 1990s has damaged his prospects. His presidential ambitions are on hold pending an appeal. Mr Juppe has ferociously denied allowing people paid by private companies and Paris city hall to work for Mr Chirac's Rally for the Republic party in the late 1980s and early 1990s. He was then financial director at the city hall, working for Mr Chirac, the then mayor. "As the boss I must assume my responsibilities," he has declared, loyally shielding from Mr Chirac from blame - though the president anyway enjoys immunity from prosecution while he remains in office. 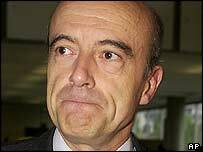 If Mr Juppe's conviction is upheld, he will be barred from public office. He would then lose his mayorship of Bordeaux, seat on the National Assembly, and secretary-generalship of Mr Chirac's Union for a Popular Majority (UMP). He said this month he was prepared for the worst. Alain Juppe, born in 1945 to a south-western farming family, was precociously intelligent. Sent to the elite National Administration School (ENA), he was talent-spotted in 1976 by a fellow alumnus - Mr Chirac, then prime minister - who made him his speechwriter. 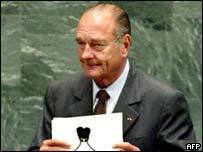 Shortly afterwards Mr Chirac broke with President Giscard d'Estaing, and assumed leadership of the neo-Gaullists as head of the newly founded Rally for the Republic (the precursor to the UMP). Mr Juppe served his mentor with unswerving loyalty through the splits, spats and disappointments of the following years, including Mr Chirac's unsuccessful attempts at the presidency in 1981 and 1988. In 1993, as finance minister under Edouard Balladur, he trod a careful path as the Rally for the Republic party itself split into rival camps. This finally saw Mr Balladur challenging Mr Chirac for the presidency in the elections of 1995, but during it all, Juppe said he was "loyal to Balladur, faithful to Chirac". As Mr Chirac's prime minister from 1995 to 1997, Mr Juppe took on the gauntlet of pushing through social, welfare and public-sector reforms. These attempts at reform ran against strong opposition both from public-sector workers and the population at large, exacerbated by a perceived secretiveness and an arrogant public demeanour. Strikes brought air traffic to a standstill, striking lorry drivers blocked the roads, schools, hospitals and post offices shut down. Only months into his premiership, he was being satirised in a TV puppet show as an unemployed punk in a T-shirt that read "No future!" But he rejected lessons to try to soften his public image. He later said: "It is always easier to smile than to reform. I tried to reform. I did not try to smile." In 1997, polls showed two-thirds of the population had "little confidence" in him. Daring voters to take on "another five years of Juppe", Mr Jospin won the election. Months before his defeat, Mr Juppe talked of escaping politics altogether, to "go salmon fishing in Ireland" or "live on a Greek island". But in fact, he then took the challenge of preparing the ground for the foundation of the UMP in 2001 and for Mr Chirac's victory at the polls in 2002. He has continued to nurture his own Bordeaux powerbase. Many commentators caution that he should not yet be written off as a political force. "He could be barred from political office for up to a decade"